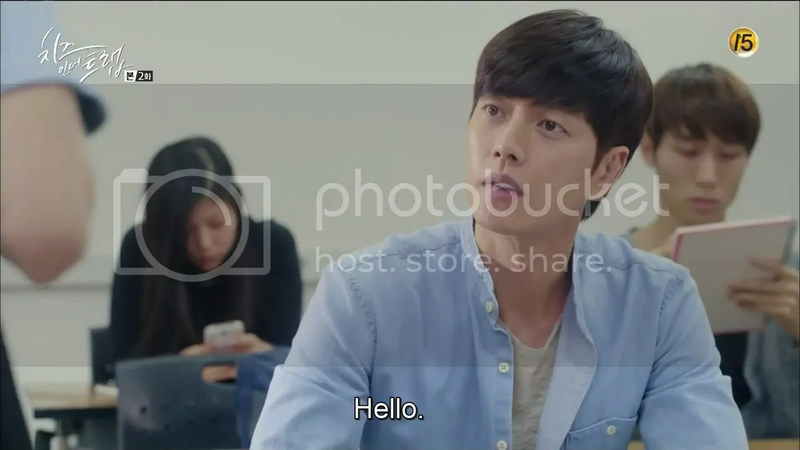 Yoo Jung sits next to Seol and gives her a wave. She waits for death. 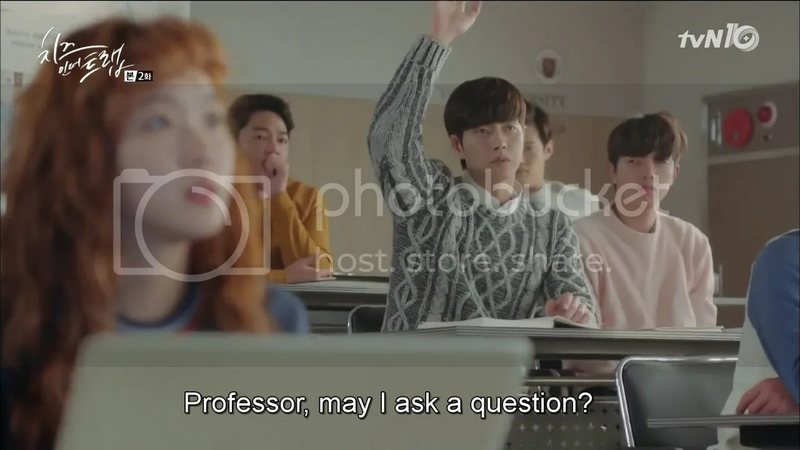 While Dr. Kang lectures on how they have to make the best of her class seeing as they’re paying ten times the tuition she did. Seol furtively packs her stuff and practically dashes out of class just as Yoo Jung prepares to ask her out for lunch. She narrates that he’s started acting more suspiciously than usual. Catching her on the way to class on another day, Yoo Jung asks her out for lunch. Seol fibs that she has plans but Yoo Jung keeps walking beside her. She walks a few steps further until she can’t take it anymore and whirls around…only to find Yoo Jung far away from her. She nearly dies of embarrassment and runs away as Yoo Jung just laughs. 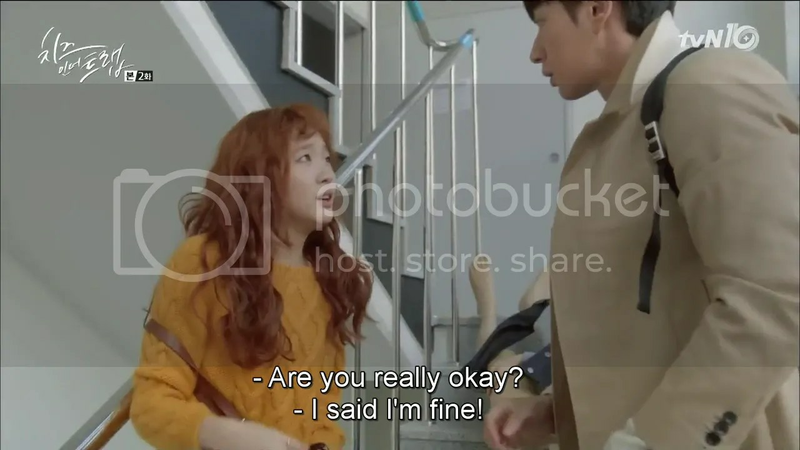 She sees him coming toward the elevator and presses ‘close’ with all her strength but Yoo Jung makes it. He asks her out for lunch once more and she said she already ate, given the time. Yoo Jung says that it’s only 11:30, noting a coupon in her hand. Seol’s stomach growls as she says that she ate early. Yoo Jung just smiles. And even she can’t take it anymore. 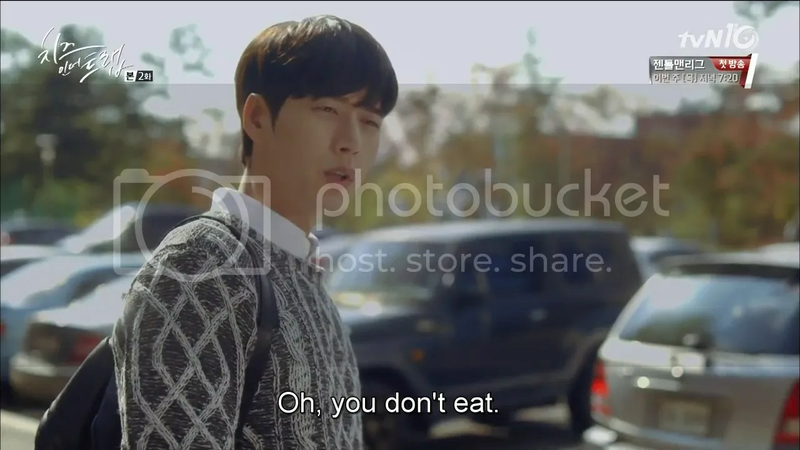 They eat samgak kimbap (triangular kimbap) at a convenience store and Seol pauses upon seeing that Yoo Jung’s made a mess of his while trying to unwrap it. She passes hers over instead and he thanks her. She falters for a second at that smile and tells herself : Get a hold of yourself Hong Seol, don’t fall for that smile. that fellow is devious. Yoo Jung then sweetly apologizes for having asked her out for lunch so many times. Seol can’t stop faltering at how sincere he seems. He humbly says that he thought she had the right of it. She can’t stop herself from saying that it’s okay and that she feels bad too. In fact, she should be paying for all of this. Yoo Jung keeps smiling but agrees. Yep, she should. That’s why she’ll be paying for dinner the next time they go out. Seol’s guard snaps right back up as she tells herself that she was right. He is devious. 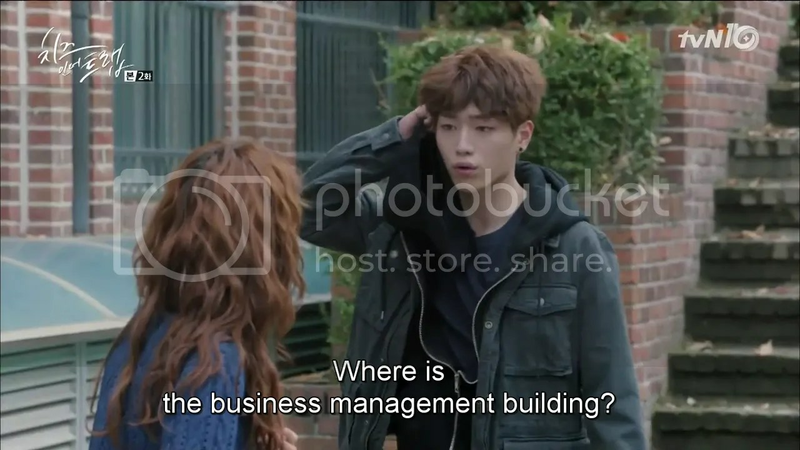 After the meal, Yoo Jung says he’s going to the library and Seol naturally pics a building as far from the library as possible but right then Kang Ahyoung, a friend of Seol’s, pops up. They haven’t seen each other in a while, and Seol’s glad that she’s here but Ahyoung spots Yoo Jung and nearly swoons. He comes over to introduce himself and Ahyoung can barely herself herself standing, complimenting Yoo Jung nonstop. Seol all but drags her away, saying that she most certainly isn’t close with Yoo Jung in respose to Ahyoung’s questions. 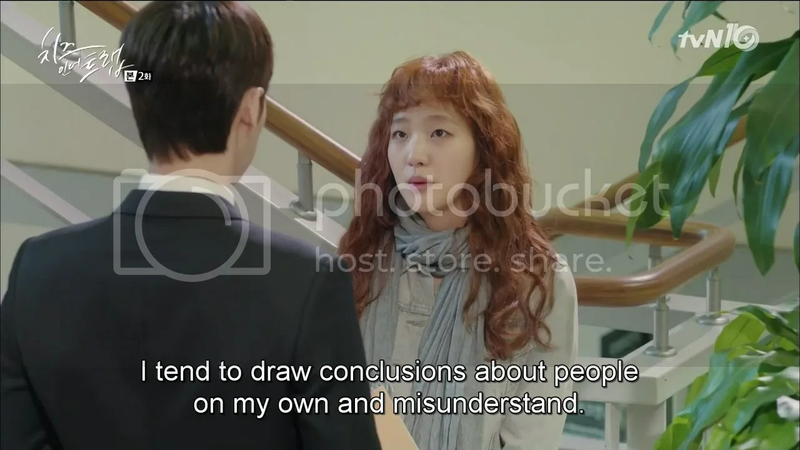 She warns Ahyoung that “There are wicked people whose thoughts you can’t figure out“and as an unni, tells her to choose her guys with more discretion. 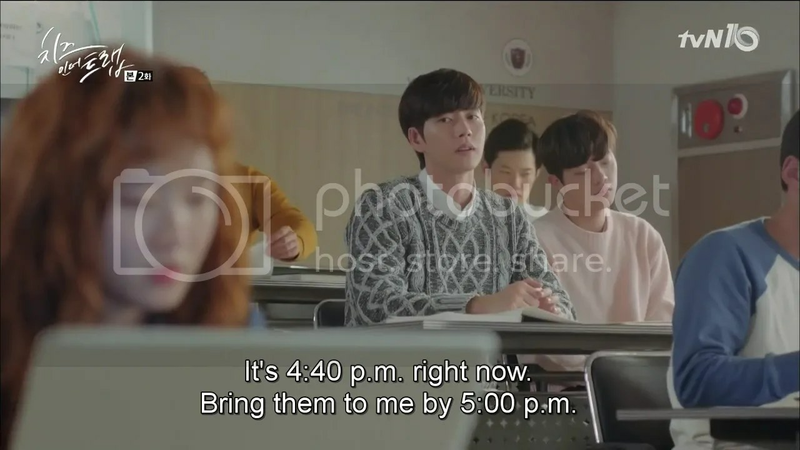 Meanwhile Baek Inho’s arrived at Yeonin University, where all our main characters are, in search of Yoo Jung. He gets mistaken as a bum by a fellow homeless person who drags him off. Meanwhile Seol’s busy having nightmares of Yoo Jung asking her out to lunch. She arrives early the next morning, planning on charging her laptop but bumps into the homeless man. She shivers and tries to leave when Inho (who was sleeping beside the man’s cart) wakes up and asks her to come over. She tries to leave but he rushes over. 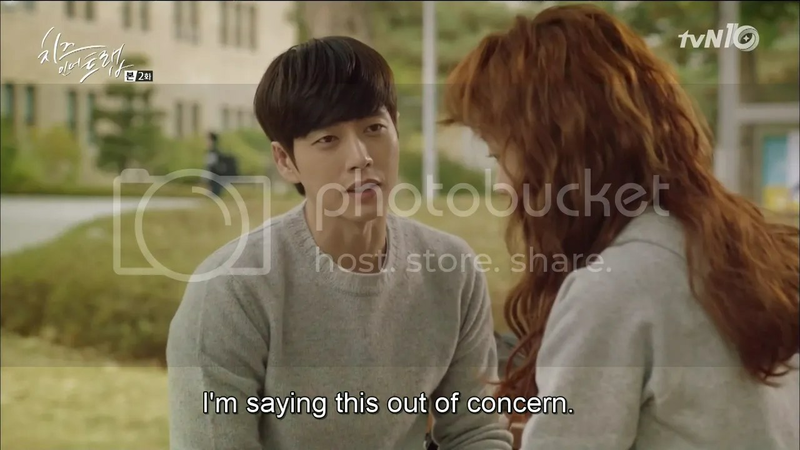 Seol lies that she doesn’t know but Inho doesn’t believe it, seeing as she’s a student here. She tries to leave but falls as he grabs her wrist. A security guard appears at that point, sees what he believes to be two bums scrounging of a girl and yells at them. Inho and the man flee, it’s only later that he realizes that he was mistaken as a bum. The man he was fleeing with takes some of his money too. Seol arrives late to class with a dead laptop. But worse, she opens it to find that her fall broke it. None of her classmates are willing to part with their laptops and she has a report due. Guess who steps in? Dr. Kang enters at that point, and begins her lecture on directional strategy and portfolio strategy. She asks what strategy is and gets irritated upon noticing that everyone’s just writing down every word she says and memorizing it instead of engaging with what she’s saying. Seol is busy retyping her report and suddenly gets called on by Dr. Kang, but Yoo Jung steps in. He brings up something on the five stages of strategy which wants int he textbook. Dr. Kang is elated that Yoo Jung even went through the textbook. It’s time to collect the reports. Seol types frantically while Yoo Jung volunteers to collect them. He has 20 minutes to bring them to Dr. Kang. Soon Seol is the only one left in class. 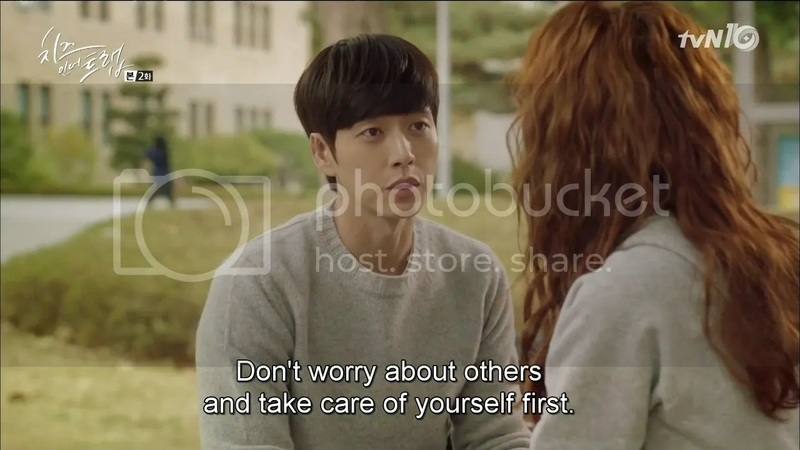 Yoo Jung sits at her side and stares. She asks him if he has to keep staring. He asks if it bothers her and she affirms that it does. Just as Nam Jooyeon walks in. Uh oh. Seol thanks Yoo Jung profusely for everything. He shrugs it off and hands her his notes as she couldn’t take any today. Jooyeon seethes watching it all, and waits for him to leave before pouncing on Seol. Seol tries to tell her that she wasn’t flirting to no avail. Jooyeon tells her not to think that Yoo Jung’s interested her because he’s just to everyone. Seol is left with WTF written on her face. Meanwhile Baek Inho’s wandering the campus wondering what on earth he’s doing there. He gets a call from a friend at work saying that the boss on the hunt for him. Inho quotes the constitution saying he has the right to quit it be wants to and lie to the boss about where he is. 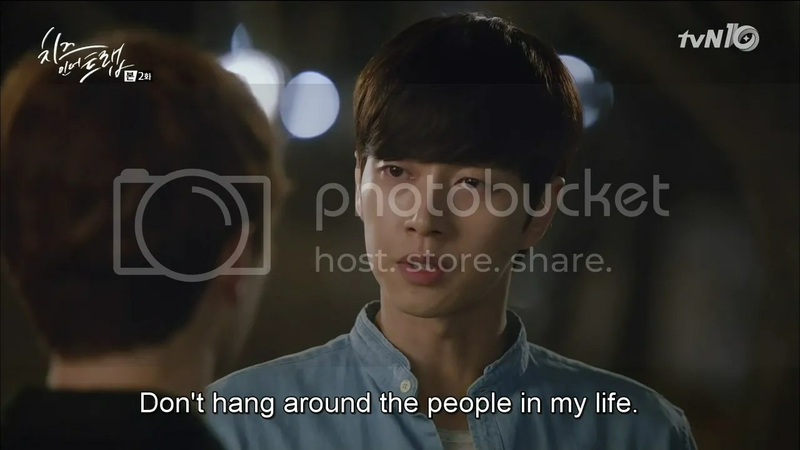 His friend Sang Geum, sighs that he’s smart for someone who was kicked out of highschool and valiantly attempts to cover up for Inho but the phonecall was seeing by his boss. As such, he knows that Inho’s in Seoul. 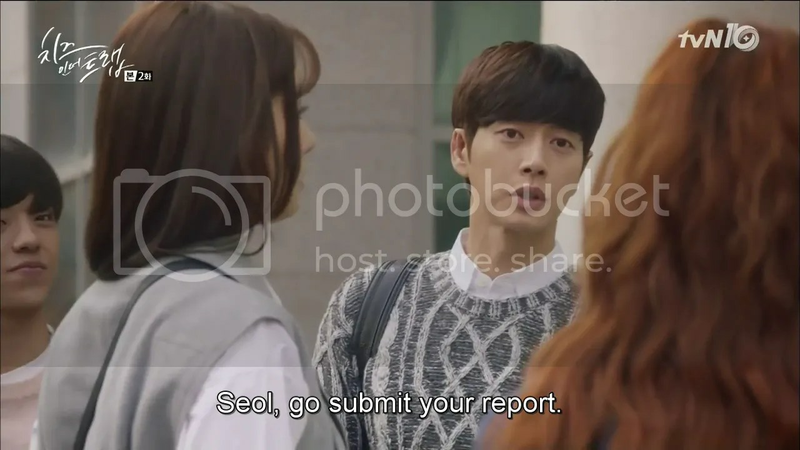 Yoo Jung drops the reports off at the department office, where the guy working there wonders why Yoo Jung isn’t going abroad, despite his excellent grades. (Does he mean what I think he means? Does the boy have a crush?) At any rate, Jooyeon enter right after when the office is empty, sees Seol’s report on top of the pile …and naturally takes it with it. Seol, who’s forgotten her USB runs over at the same time Jooyeon exits the building with her paper and recognizes her work instantly. She demands for its return but Jooeun petulantly sniffs that it’s not even like Seol wrote it herself. 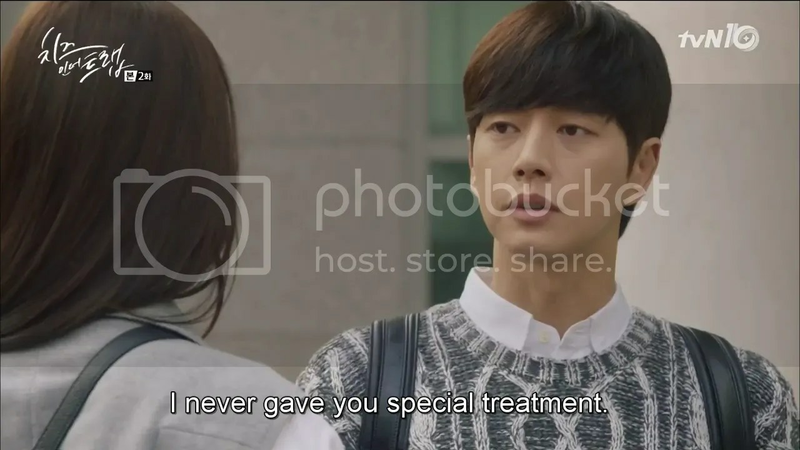 She insinuates that Yoo Jung did, and that Seol was jealous of all the attention he paid her. Yoo Jung walks in at that point with a friend who asks Jooyeon if they’re filming a soap opera. BURN. 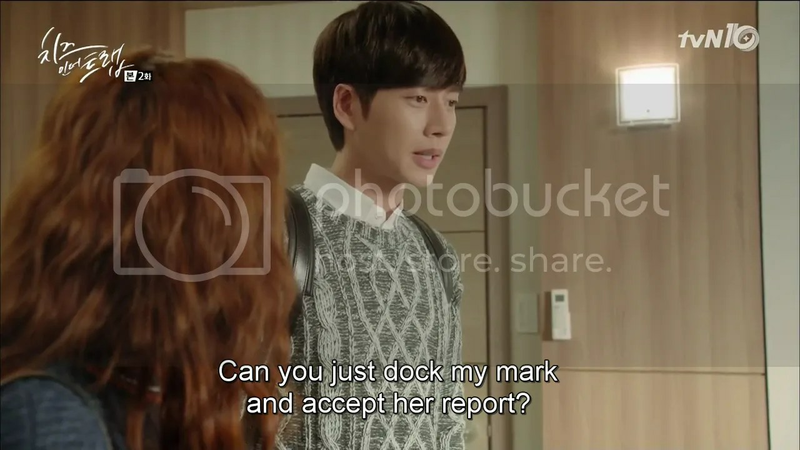 Seol tries to hand in her report only for Dr. Kang to reuse to accept it. 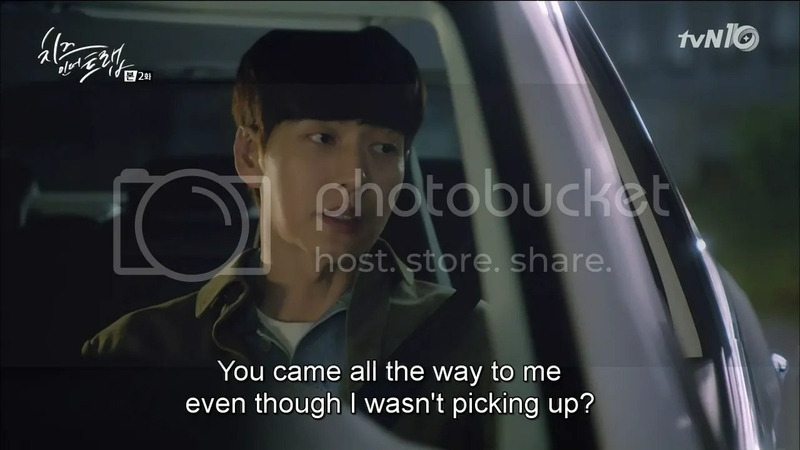 Yoo Jung arrives at that point and takes the blame, saying that he forgot to collect Seol’s paper. Dr. Kang accepts the paper but still tells Seol that she won’t receive higher than a B+ because her paper was substantially late. She’s lost in thought on the way back on how to make up the mark and Yoo Jung tells her he’ll help. 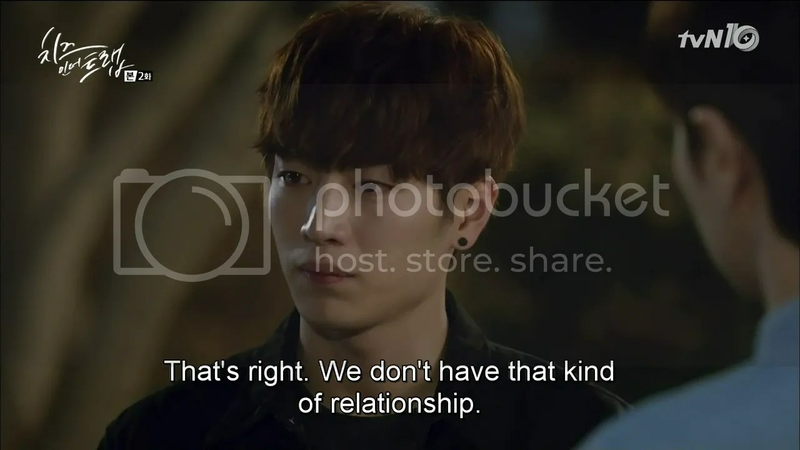 Seol wonders if he really means that and isn’t sure of anything at this point. Seol is left behind looking very confused. Meanwhile the guys, including Sangcheol and Euntaek are busy going through the girls in their club and voting for the best-looking. Bora is criticized for her eyes bugging out too much which pisses Euntaek off. Bora calls, saying that he’s late for their meeting but Euntaek’s too busy counting votes. It’s a tie between Bora and Jooyeon but Bora wishes. Sangcheol wonders what the girls would do if they knew just as Bora charges in, yells at the lot of them for engaging in such childish behaviour, and drags Euntaek out. Sh’es even more infuriated upon hearing that Seol tied for last place. 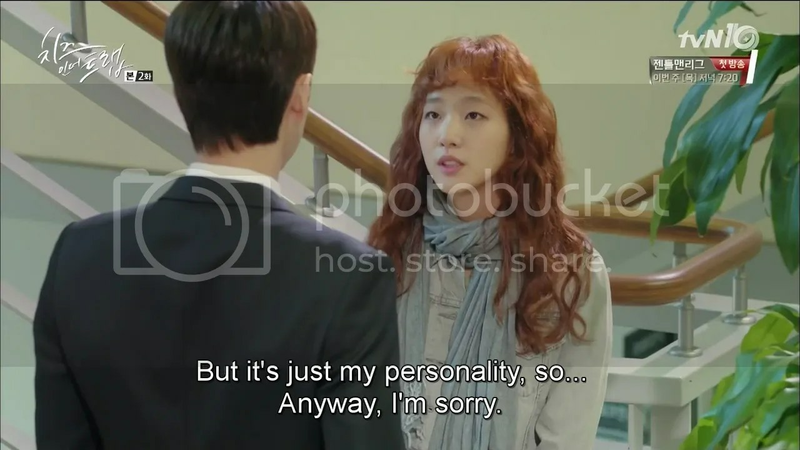 She says that she was supposed to go on a date with this one good-looking fellow (an admission which startles Euntaek) but she’ll pass it over to Seol. 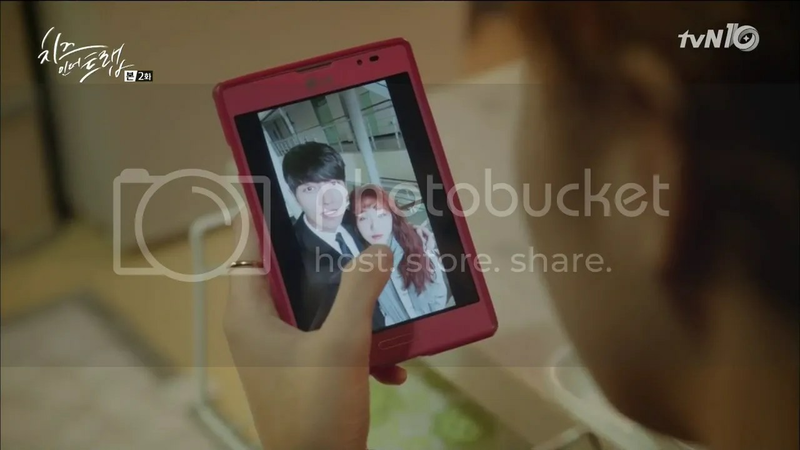 Euntaek happily agrees with what a good idea that is. Meanwhile, Seol can’t find an empty seat in the library. Just then Yoo Jung and crew (including Jooyeon) saunter up. Jooyeon coos that she’s saved Yoo Jung a seat in the library but Yoo Jung actually removes her hand from his arm and says that he’ll find his own and that he’ll find one for Seol too. 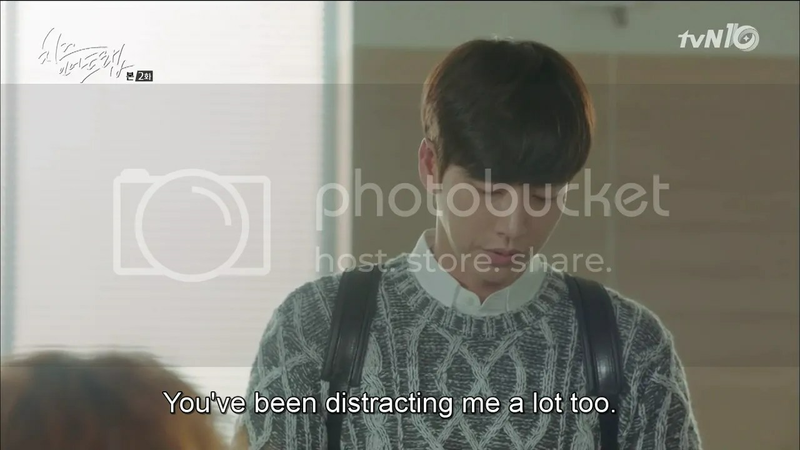 She’s just leave dumbfounded as he leaves and asks Euntaek and Bora for their clubroom’s password to go and study on her own there. They give it to her on the condition that she goes on that date. Meanwhile Jooyeon forlornly texts Yoo Jung, asking if he’s found a seat. Right then she’s seized by the bum from earlier (who was with Inho). 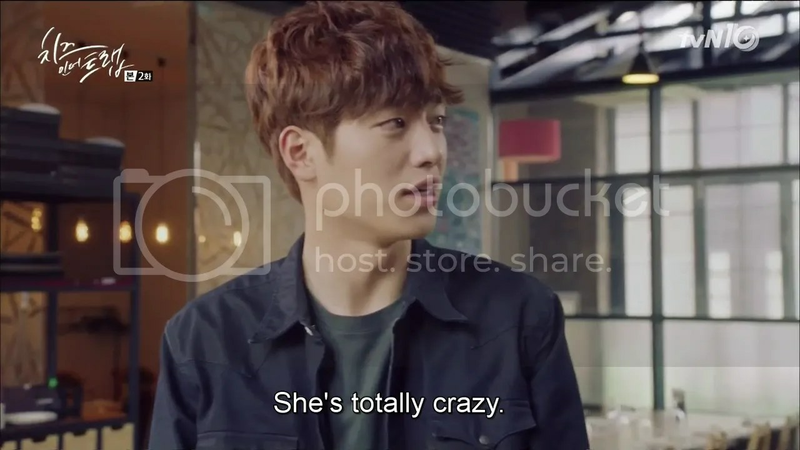 He’s roaring drunk and about wrest money off her when she points him in Seol’s direction and tells him that girl over there will give him as much as she needs. A smirk crosses her face as the man leaves. The man drunkenly weaves up the stairs towards Seol and his soju bottle smashes, which frightens her. 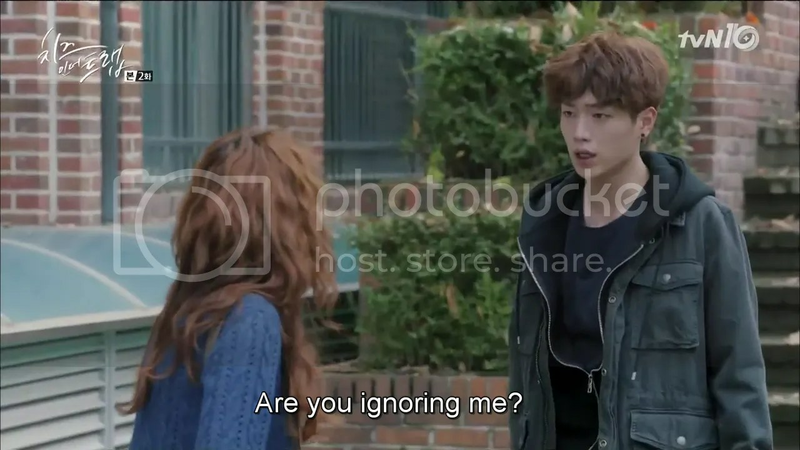 Jooyoen runs to find Yoo Jung telling him that she saw a drunk guy ask Seol for money, and that Seol pushed him away. It angered him so he chased after her. 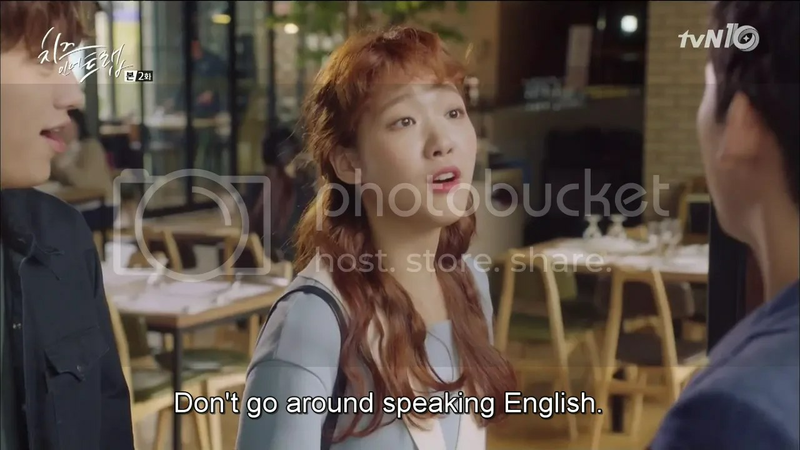 She uses it as a segway to say that Seol does speak harshly hence their fight yesterday. She says that Seol is a woman after all and has never liked how close Jooyeon was with him. 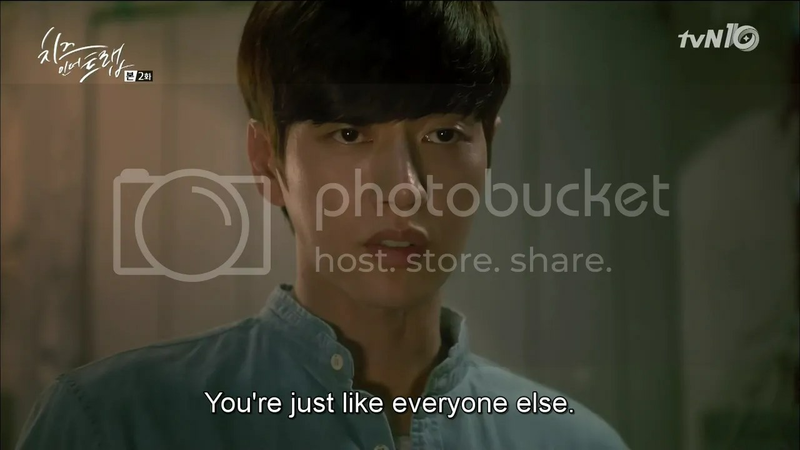 Yoo Jung doesn’t buy it. He tells her that she created this situation so she should take care of it, and drives off. Seol is scared out of her wits and tries to silently leave the building but is caught by the homeless man. He slams his bottle on her arm It breaks, cutting her skin. 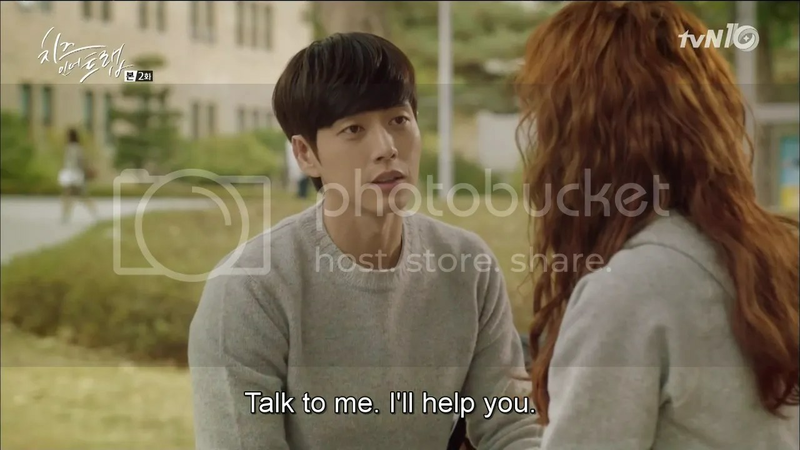 The police officer arrive at that point, and rescue Seol, no thanks to Jooyeon who never even called them. The next day, Seol’s fishing out a soft drink when Yoo Jung pops up and gets it for her. He notices her cut and immediately takes her hand. He carries her things and takes her outside to treat her wound. Seol narrates that she’s feeling something unlike anything she’s felt before. Yoo Jung brings up Jooyoen and Seol says that Jooyeon really him a great deal, so from her POV anything that Yoo Jung does for her, would hurt. Yoo Jung breaks into a grin. Meanwhile, Sangcheol borrows Jaewoo’s laptop to go through his presentation the previous year (the same one Sangcheol has coming up now). The latter lends it very grudgingly. Sangcheol spies Seol studying in a corner and asks her to quickly locate the file for him while he takes his grad photos. 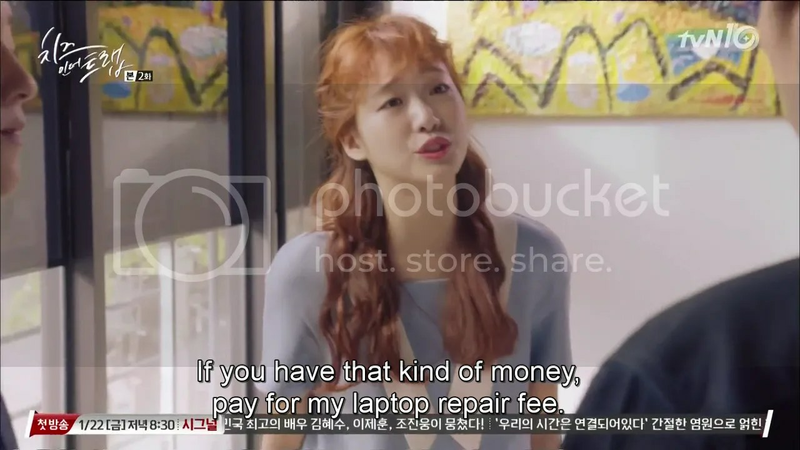 Seol agrees and browses about Jaewoo’s hard drive in search of the picture when she finds club receipts. The same ones that had been post on the student messages barods the previous year, that accused Sangcheol (rightly) of embezzling money from the club fund. 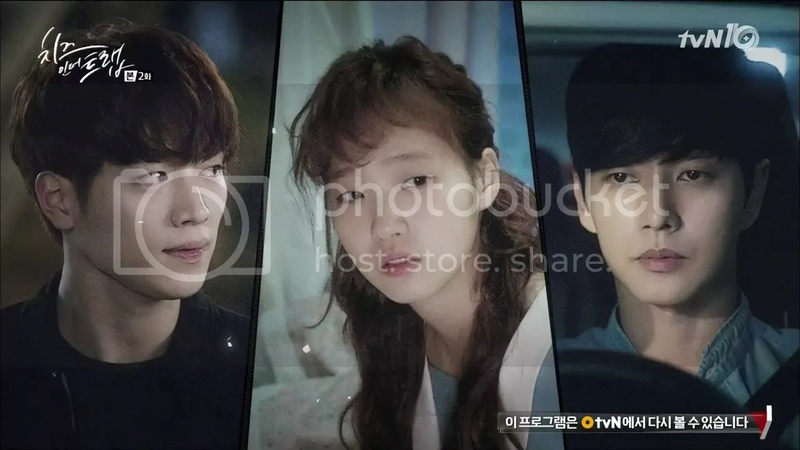 She realizes that it wasn’t Yoo Jung but Jaewoo who had told on Sangcheol. Jaewoo snatches the laptop from her at that point and Seol stammers that she won’t tell anyone. She walks ona nd finds Yoo Jung lost in his own world, playing with an ant. She wonders if she’s been drawing the wrong conclusions all this time. She returns his notes and awkwardly asks if she could buy him a meal. She mutters that he has helped her a great deal and there’s stuff she’s sorry about. 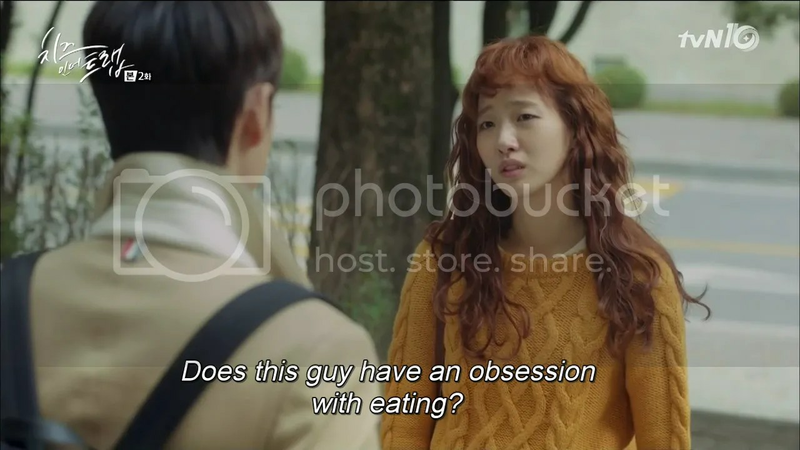 Yoo Jung agrees that it does seem like she’s like that. Seol says that she’s trying to fix it. No, she’s going to fix it. She’s all ‘no way’ but in the spirit of reconciliation doesn’t really know how to refuse. She tries her best to get out of it saying that she’s sure he likes taking pictures, but he slings an arm around her shoulders and snaps one. At home, Seol sighs at the picture Yoo Jung sent her, wondering why her eyes are like that. She gets a call from Ahyoung who’s over the moon that Yoo Jung remembered her name and bought snacks for all her friends. 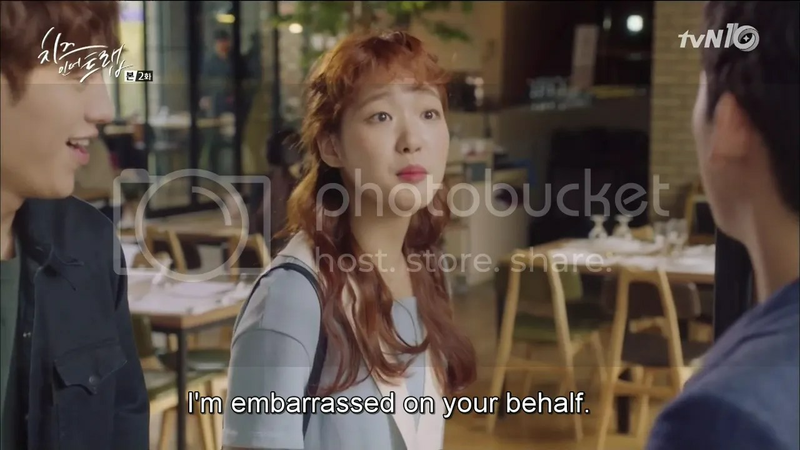 She asks Seol to help her with Yoo Jung (oh boy I see this going badly) and Seol thinks that Yoo Jung does seem like a good person, and agrees. Oh dear. 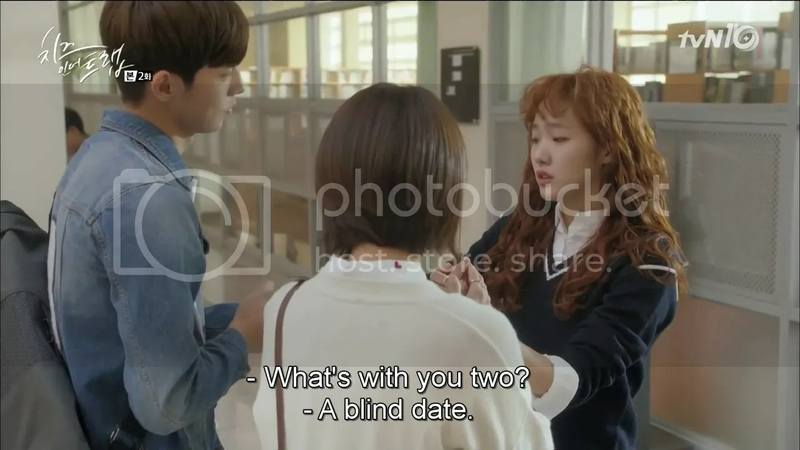 Seol barely gets a foot into campus the next day when Euntaek and Bora drag her off for her blind date. They stuff her into an empty classroom and make her change while Bora applies makeup. She looks 80’s gorgeous when she’s done. 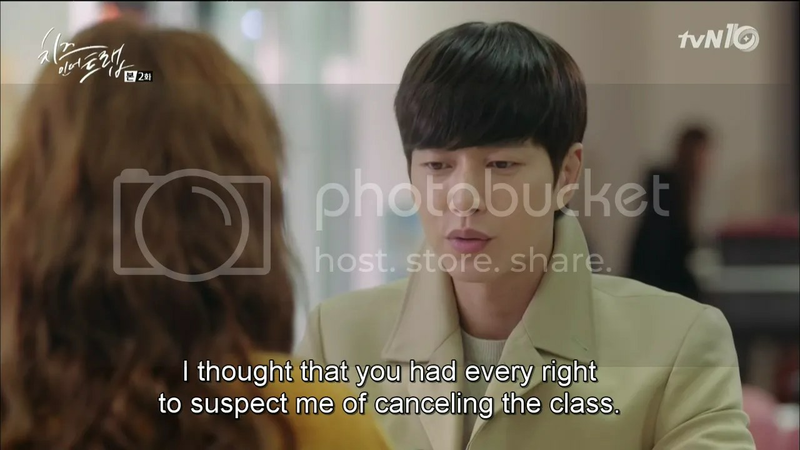 Only it’s awkward because she has class with Yoo Jung later. 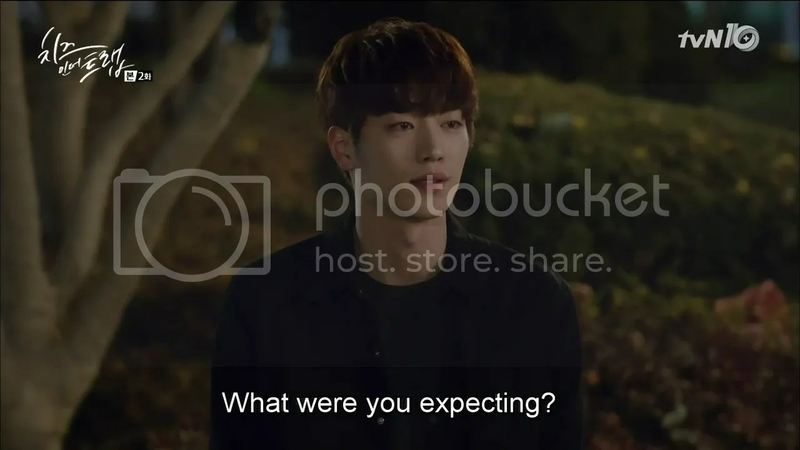 Yoo Jung gets quite a surprise at the-make-over and Seol awkwardly stresses that it’s because she has somewhere to go later. Ahyoung chooses to call then, and inform Seol that she’s confessing today. 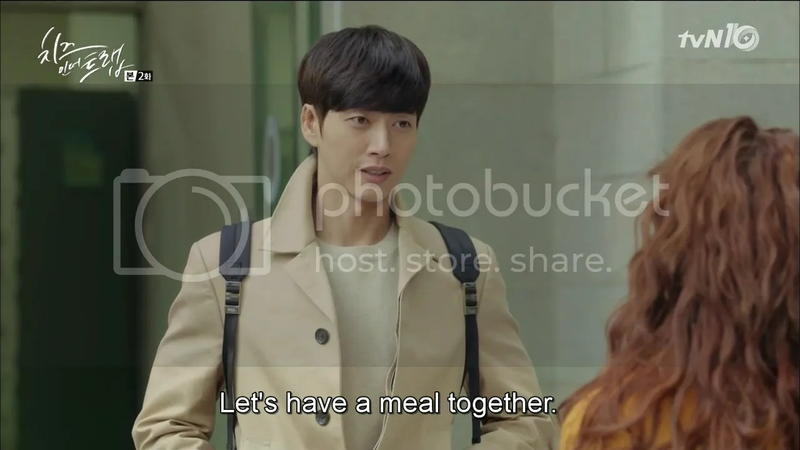 Seol has no choice but to ask Yoo Jung if he’s free after class for dinner. (It awkwardly makes it seem like she’s dressed up for him as well). Ahyoung crashes the party as planned. 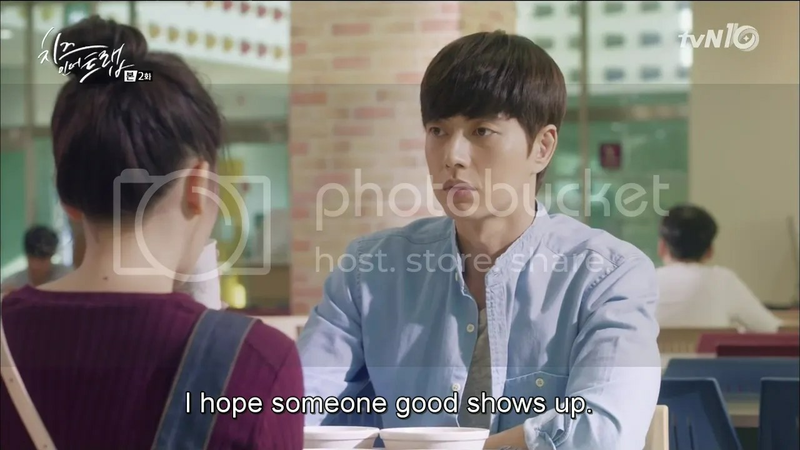 Yoo Jung seems fine with it and Seol goes on to praise her virtues over diner and even says that she’d be a good match with him. She awkwardly excuses herself to get coffee for both of them and then makes her exit. 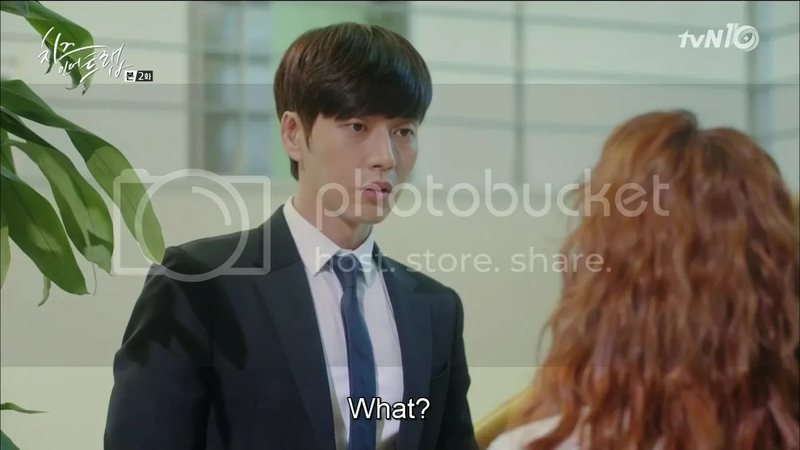 Yoo Jung (nothing is ever as it seems with this fellow so I’m going with how he looks outwardly in this scene) seems surprised at her department. Ahyoung sighs that she wishes Seol would always dress that prettily. 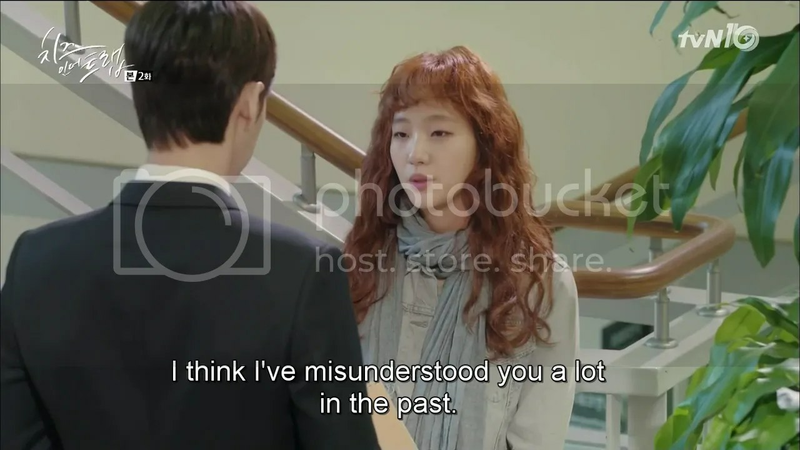 She tells Yoo Jung that it’s because of a blind date Bora set her up on and Yoo Jung falters for a moment. 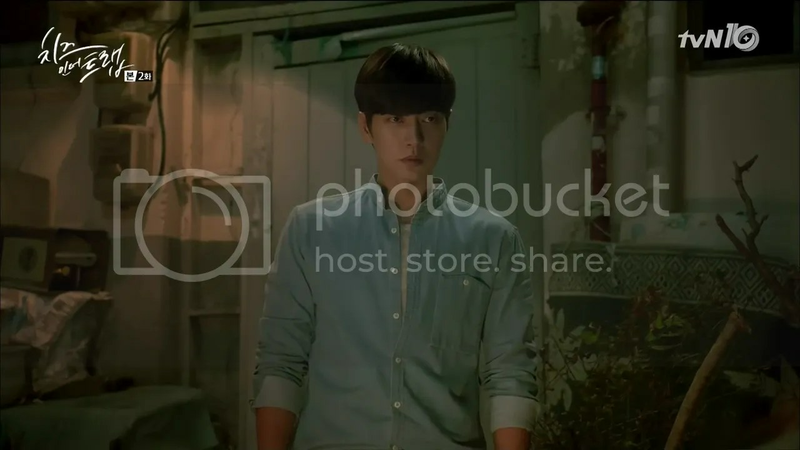 Meanwhile, Inho’s applied to the very restaurant Seol’s about to enter, only to be told that he doesn’t have the right image to work there. Seol’s in the middle of a nightmare date who’s just rich and snooty and yaps about all the awesome things he’d done (like paragliding) and the depth of his knowledge (Schubert’s 4th movement). He snorts at the sort of life Seol must have led to now know stuff like this. 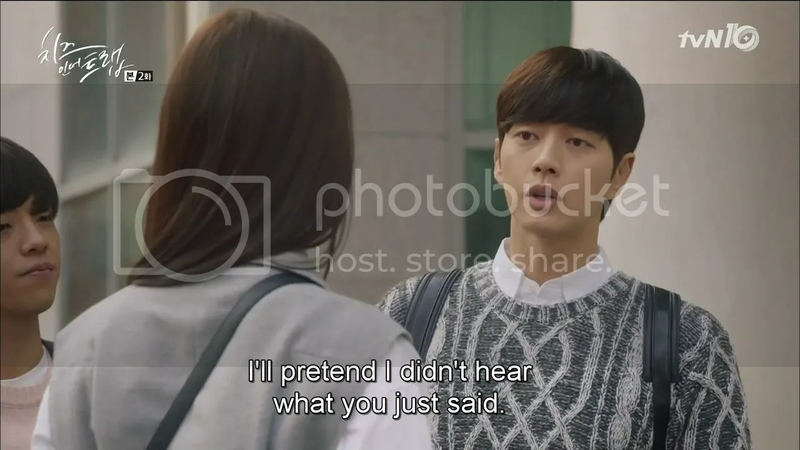 Inho overhears all this and recognizes Seol immediately. 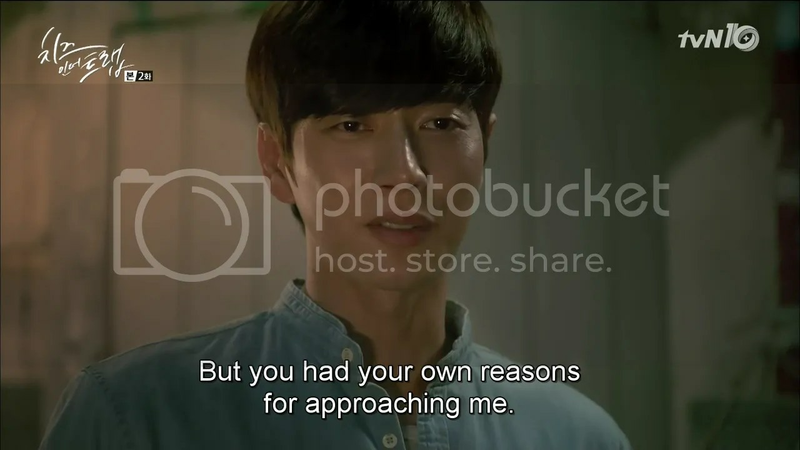 His temper flares up and he yells at the guy for being such a sleaze and at Seol, whom he’s mistaken as being no different from his sister. He says he thought she was something judging by how she kept her distance from him on campus but she’s no different. He prepares to hit the guy and she asks whether he has to money to settle the huge suit that will be dropped on his head if he touches someone this rich. Inho doesn’t get what she’s talking about. 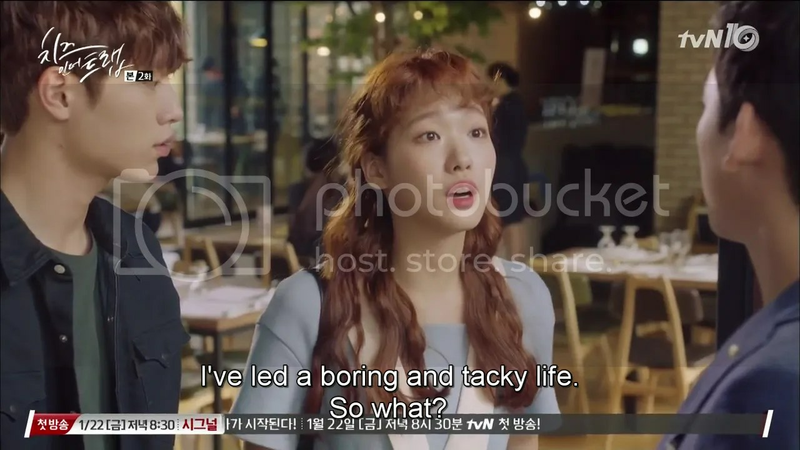 Seol wonders what the hell she’s doing here and prepares to leave when the blind date makes the mistake of assuming that Inho’s an acquaintance of Seol and calls her tacky. That gets her pissed. Inho watches with his mouth open and is mighty impressed at her spirit. He grabs the guy as he makes to leave and points out that it was the fifth not the fourth movement that was played. 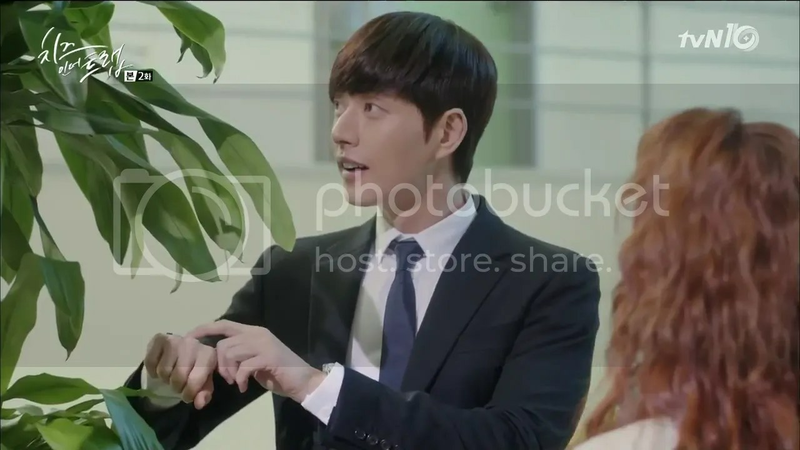 The guy dashes out but Inho’s noticed that Seol left her phone behind. She glumly walks home only to find Yoo Jung waiting for her (looking a tad psychopathic). She wonders what brought him there and asks if he enjoyed his meal with Ahyoung. He half-snorts at that, staring at her all the while. Whoa! He leaves without even looking at her. She mutely watches him go. Meanwhile Inho marvels at how cheap her phone is. He sighs that he can’t even sell it for money. 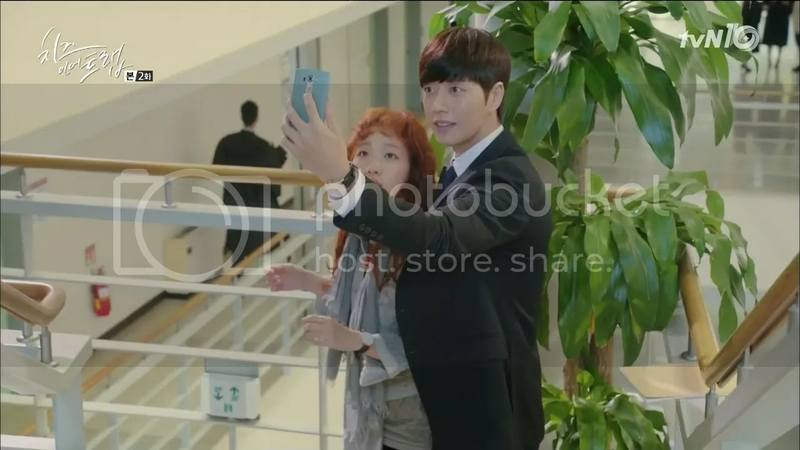 He goes through her contact list and finds a Yoo Jung sunbae on there. 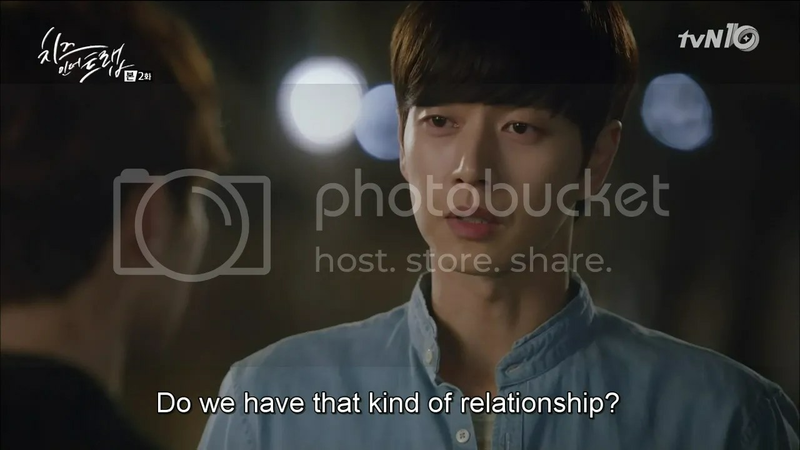 He dismisses it at first, thinking there’s more than one Yoo Jung in Korea but he sees the picture of them both on her phone and pauses, thinking that this girl is Yoo Jung’s girlfriend (oh boy) while wondering what the hell is up with her eyes (HAHA). He calls Yoo Jung from her phone. Yoo Jung stares at Seol’s name for just a few seconds before picking up and quietly telling ‘her’ to go ahead (Why does he suddenly seem like a puppy?) Inho answers instead and Yoo Jung instantly knows it’s him. He asks where Inho is and drives over. Brrr. 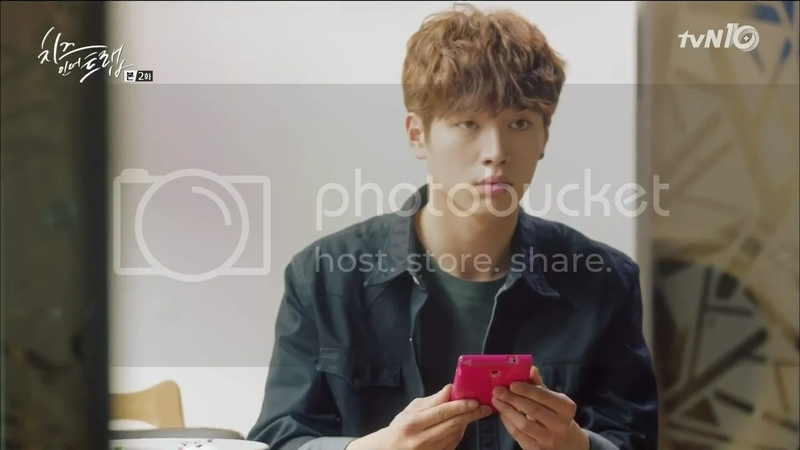 Yoo Jung just wants the phone back but Inho wants to know what sort of relatioship Yoo Jung has with Seol to have taken a photo with her and to come running to get the phone back. Does she know what sort of person he is? Inho inquires as to what’ll happen if he does. 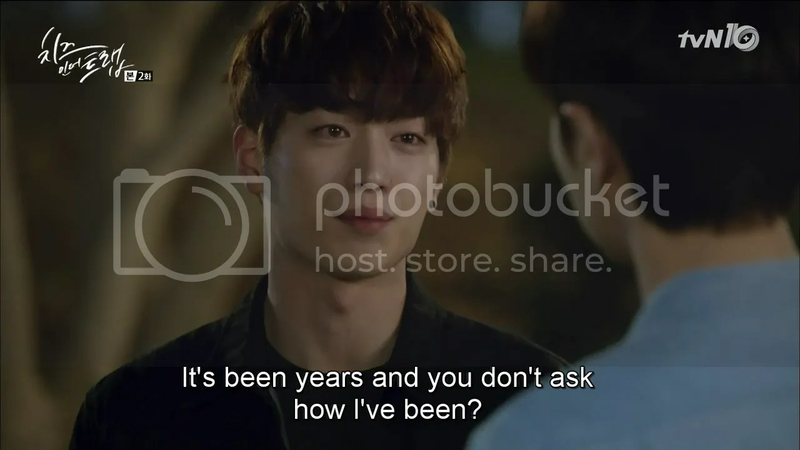 He asks if Yoo Jung’ll do the same thing he did last time. Yoo Jung scoffs at that, asking if he’s still going on about that. He thought that Inho had changed for the better these past few years. Guess not. Inho retorts that he’s the one who hasn’t changed, and doesn’t feel an ounce of guilt for having messed up someone’s life so badly. 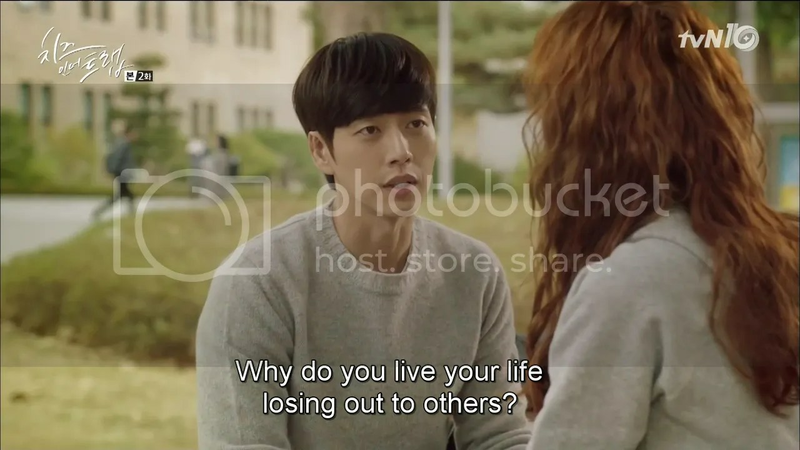 Yoo Jung wonders why he should feel guilty. Inho flashes back for a brief instant and it looks quite brutal. 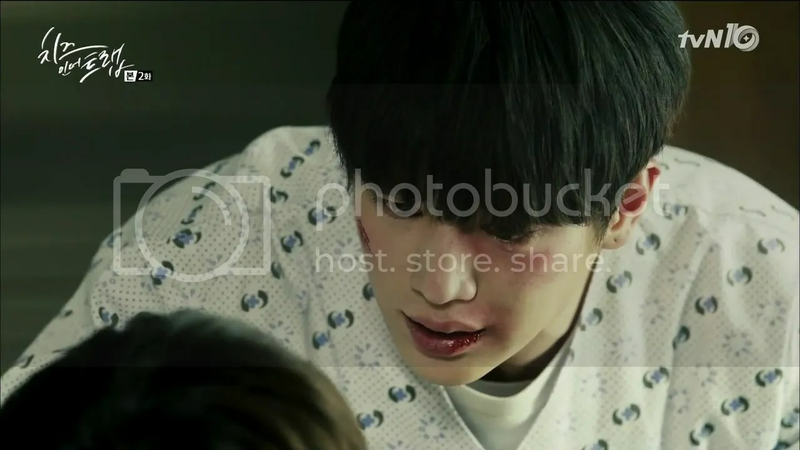 He appears to have been severely beaten up and Yoo Jung walked by while he was being kicked about without lifting a finger to help him. Yoo Jung says that financial support to him and his sister will end once he graduates and works at his father’s company. All he’s been doing has been out of pity. 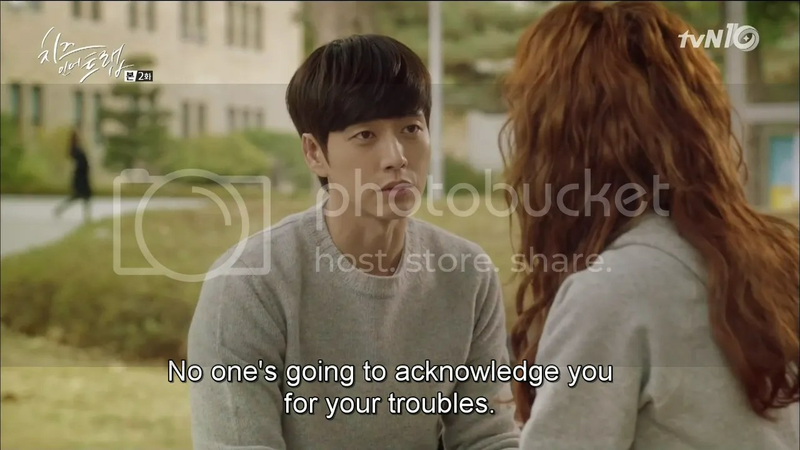 Inho’s furious but Yoo Jung tells him to convey that message to his sister as well. Their years are numbered; they have to find a way to support themselves. He warms Inho not to do anything stupid and just return the phone, and drives off. Inho flashes back to a time when his sister, Yoo Jung and him set off fireworks on the roof of a building, in their high school uniforms. Meanwhile, Seol prepares to turn in for the night, looking very preoccupied.